Go back to year 1995 and don't come back. DirLister version 2 is available from GitHub: https://github.com/SanderSade/DirLister . Version 2 offers additional functionality and many other improvevements, as well as future updates. It is recommended that you use v2 over the v1, which is no longer supported or updated. The current page and v1 download will remain here for people who cannot use .NET v4.6-based programs (that means Windows Vista and below). DirLister is an utility for quickly listing folder or drive contents. 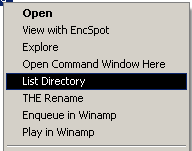 It may be run from graphical interface or Windows Explorer right-click menu. As you can see, the graphical interface is very simple. Browse for the folder, select setting and output file - and you are ready to go. Note that the settings you chose will also be used from shell right-click menu. Output format is either HTML or plain text file. In first case, hyperlink will be created for each file. "Open file" means that after creating the directory listing, resulting file will be opened in your default browser or text editor, resp. "Recursive mode". If enabled, DirLister will list selected folder and all subfolders. If unchecked, subfolders will not be scanned or listed. "File mask". Wildcard mask to use for listing, both * and ? are supported. Very useful if you want a list of all jpeg images in a folder, for example. As I said before, the settings you selected from user interface will be used when selecting a folder - with one exception: filename. If you list a folder, then output file will be in the current folder and the filename will be "DirLister <fullpath to folder". For example, if you list c:\Windows\System32\ then the file will be in c:\Windows\ with a name "Dirlister C_WINDOWS_system32.html". If you want to list a drive from "My Computer", then you will see a menu item "List Drive". That will place the list file to the root folder of the drive being listed. Of course, if the drive is non-writable (such as CD or DVD) then it is not possible to put file there and you will have to list the drive from GUI. (Note. I will fix that to ask for a filename - but not before I need that myself). This is how HTML list looks like. Note that I used wildcard *.s? ?